If you want evidence that chivalry isn’t dead in today’s world, all you need to do is visit a quiet suburban neighborhood in the Calif. town of Turlock, just east of San Jose, where you’ll find a school called the Knight’s Quest Academy of Chivalry. There, on pretty much any afternoon or evening, you’ll see the school’s founder Gemini Asonte, teaching students of all ages – from 5 up to 50 and beyond – his particular brand of combat with swords and other medieval weaponry, which he calls oplomachia. 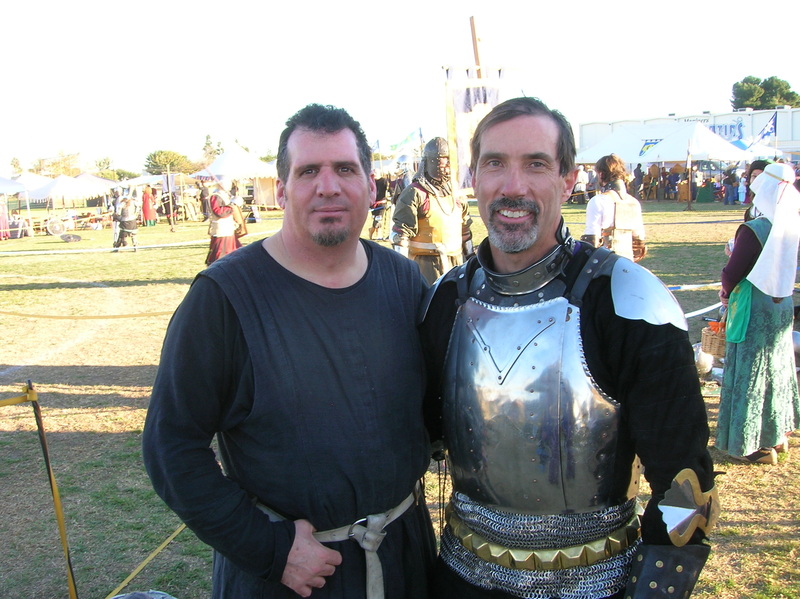 Gemini himself has more than 30 years of experience in martial arts of all sorts, and, as you might expect with such a background, his method incorporates a variety of foundational techniques in a very systematic approach to learning the medieval sword-fighting skills. Beyond his considerable talents in sword combat however, Gemini’s program also involves teaching medieval arts and sciences, and exploring the values and ideals of the code of chivalry. In that way, Gemini’s medieval combat school creates truly Renaissance men and women. 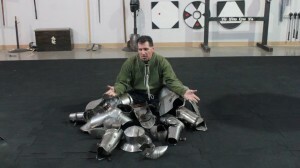 Fortunately you don’t have to make a pilgrimage to the Knight’s Quest Academy in order to begin your study of oplomachia – Gemini’s teaching can be seen on his video podcast The Modern Medieval, which you can find on YouTube, as well as on his first instructional DVD, Oplomachia: Basic Sword and Shield, which has just been released by Knight’s Quest. Gemini Asonte joins show host Scott Farrell (the two are pictured here together at a recent medieval reenactment festival and martial arts tournament) for a conversation about his style of medieval combat, and how he goes about the task of teaching his students to – as he puts it – be safe, train hard, and be knightly … by following the code of chivalry. Learn more about the programs offered, and find a calendar of Gemini’s upcoming teaching seminars and other appearances, on the Knight’s Quest Academy Facebook Page.